Used Coffee Grounds (UCG) have been used on plants and in compost for hundreds of years. Somewhere along the way most of us gave it away, stopped growing our own food, and relied on an increasingly effective industrialised effort to provide food to the table. Most of us are totally dependant on food production systems which exclude us from all but the final step of consumption – We buy and consume only the end products, and if for whatever reason the shelves become empty, the only thing left to do is starve. I wanted some measure of control over how my food is produced, while appreciating the environmental footprint of doing it. The first step was to start improving the quality of my soil through compost, fertilizer, and vermicast. This is when I discovered an almost limitless and cost free additive to all three of those crucial soil amendments – Used Coffee Grounds. Since March 2010, I have collected over 2 tonnes of used coffee grounds, and it has all been used in my compost bin, dug into raised garden beds, around the base of fruit trees, liberally sprinkled over the lawn, or handed out to family and neighbours. Unless you had heard of, or used coffee grounds in your garden, you might think it all weird. As we go through some of the environmental benefits and physical properties of the material, it quickly makes sense why more of us should be making use of it. As the hundreds of YouTube videos attest to, this knowledge is enjoying a digital age revival. Approximately 20 grams of coffee grounds remains every time an espresso machine is used, which is then typically thrown into the bin, and ends up in landfill. 20 grams might not seem like a big amount, until you consider that 5000 lattes work out to about 100 kilos of used grounds, 50,000 lattes work out to about 1 tonne. Think about the millions of people who stop into cafes or use an espresso machine at home at least once a day. All those tens of millions of drinks make for many tonnes of landfill each and every day. Given there is so much of the stuff being generated, availability is not an issue. Most cafe owners would be more than happy to put some coffee grounds aside for you if you ask. One chain that actively provides this service is Starbucks, who have an initiative known as ‘Grounds for your Garden’, and if you have been in their stores over the past five years may have noticed a stack of 2 kilo bags sitting in a basket at the front of the counter. Another way to get supply, and one of the things I do, is to arrange to collect coffee grounds generated at work. My building has at least 5 espresso machines which are emptied daily, and all the used grounds are left for me in a room in the basement car park. It took a couple of tries to get the process working, but now I’m collecting around 100 Kilos per week, thanks to all my colleagues and their love of coffee. What is in Coffee Grounds? There will always be variation with a natural product, and the specific contents of coffee grounds can change slightly depending on the origin of the beans, how they were roasted, ground, and used in the espresso machine (including the water that was used). These are however what you would typically expect. Nitrogen is an abundant element in our atmosphere and when converted to a solid form is readily used by plants. Coffee grounds have a carbon to nitrogen ratio of 20 – 24:1, which is about the same as grass clippings. The relatively high nitrogen content makes coffee grounds a ‘green’ addition to the compost bin, and a great offset against high carbon ‘brown’ additions such as leaves (60:1), straw (75:1), and cardboard (350:1). Much of the nitrogen within coffee grounds is of a type that must first break down in the soil before the plants are able to make use of it, which makes the grounds just like a slow release fertiliser when put directly into the soil, providing ongoing nitrogen input into the garden. Used coffee grounds (UCG) are slightly acidic, with a range typically between 6.9pH and 6.2pH. It would be higher except that most of the acid within the beans is extracted during brewing. For many vegetable and ornamental plants, the desirable pH range is 6.9 to 5.8. A pH level of 7.0 is considered neutral, and from there it is increasing in alkalinity. Coffee grounds contain phosphorus and potassium (which with Nitrogen completes the macronutrients required for all plant growth), and includes magnesium (a secondary nutrient) and copper (a micronutrient), in sufficient quantities that you will not need to get these from other sources. In learning about organic gardening, I have come across a large number of traditional methods for controlling garden pests. If for example, I make a solution of soap, garlic, chilli, and water to deter aphids, then that’s one less bottle of chemical poison in the environment. Coffee grounds have long been used in gardens because of their impact in controlling pests. When applied to the soil of your garden, coffee grounds will deter snails and slugs, which are affected by even trace elements of caffeine, but more so because they don’t like travelling over the course grounds. I have seen a dramatic reduction in snails and slugs since using coffee grounds in the soil. If you have them in plague proportions and the above is not effective, you might want to try fresh coffee grounds, before the caffeine has been extracted. I have seen a similar reduction with ants, and although not as troublesome as snails and slugs, they can prove damaging to seeds and seedlings when in large numbers. Having a layer of coffee grounds acts as a barrier that ants will not readily cross, and while the effects are not as long lasting as the chemical ant barriers, they do not contain all the poisons either, and it is no trouble putting down more grounds once the first lot has broken down. Although I have never had a problem with cats in the garden, there is some evidence to suggest that they do not like the smell of coffee grounds and will prefer to keep away from it. 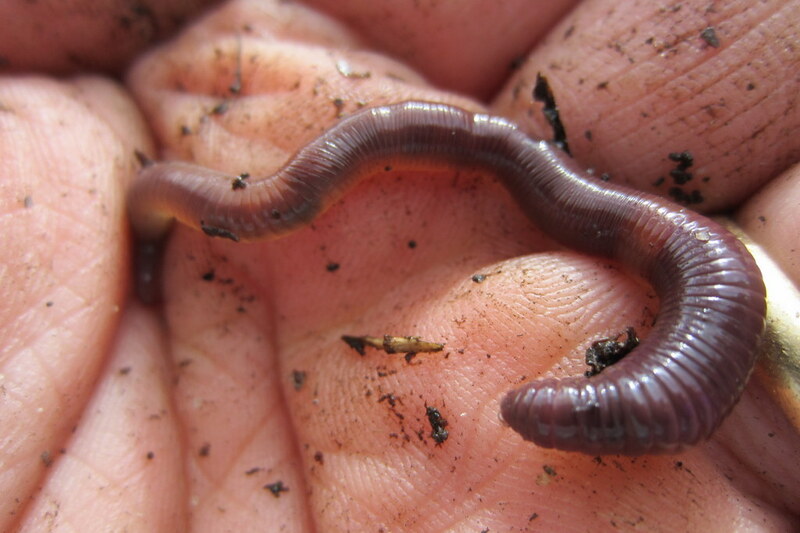 One creature that does love coffee grounds is perhaps the most beneficial to the garden, these being earthworms. From my own experience and from many others, they love the stuff, are attracted to it, and your soil will be healthier as a result. This applies just as much to the worm farm as it does to applying it directly into the garden. Worms of all types will be more productive as a result. A gardener once told me that he didn’t feed plants, he fed the soil which feeds the plants. As long as you have good quality soil, you will have more healthy and productive plants. In addition to the result it brings to the garden, there is a great deal of satisfaction in returning a good percentage of our ‘garbage’ back into the earth. When added to your compost bin or heap, coffee grounds will raise those internal temperatures, which speeds up decomposition, and the end result will be beautiful, black, rich compost. The most common ingredients I use for compost now are kitchen scraps (no meat or pineapple and limited citrus), shredded cardboard and paper, coffee grounds, leaves and twigs, and any edible plants no longer being productive. I would recommend limiting the use of coffee grounds in the worm farm or compost bin to about 25% of the total volume. The reason being is that you need a balance of ingredients with most recipes, and this is no different. If you would rather use ground coffee as fertilizer in liquid form, add half a kilo of coffee grounds into a bucket with 10 litres or so of water, let the mixture warm up to ambient temperature, swish it all around and then apply directly onto your plants. I have heard that this works particularly well with roses, camellias, azaleas, gardenias, hydrangeas, rhododendrons, and blueberries. There is one final benefit; your garden will carry the aroma of freshly prepared coffee for sometime after being applied! Ground to Ground and how you can get involved! For Cafes wanting to reduce their contribution to landfill, and demonstrate to customers your environmental commitment, you will find the article ‘How a cafe turns coffee grounds to compost‘ a good place to start. When you feel ready to give it a try, we can add you to the map below, so everyone will know about it. 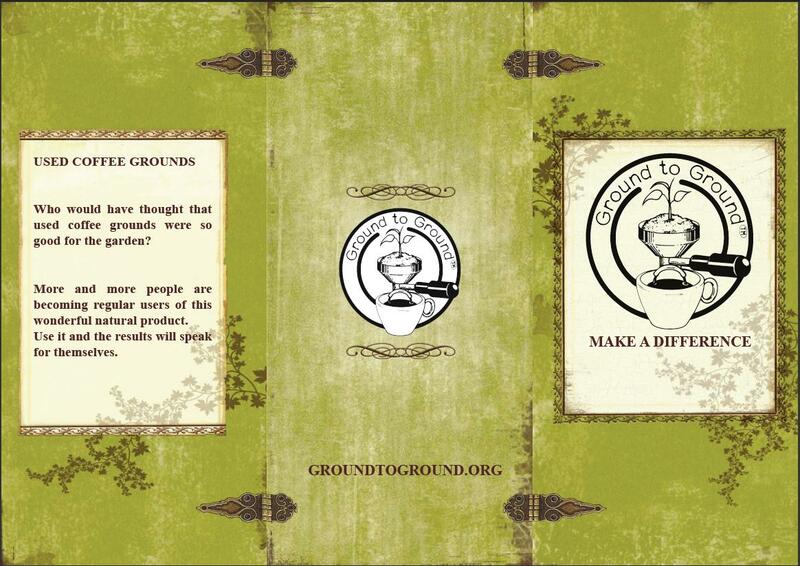 You are also welcome to print out copies of the Ground to Ground Brochure to give to your customers. It is an easy way of letting them know the benefits of coffee grounds, which makes giving them out easy. If you have an espresso machine at the home or office then you have everything you need to start using spent coffee grounds. You will find the Collecting Coffee Grounds from the Office series of articles outline all the steps you need to take. To join the many volunteers and cafes that are involved in the Ground to Ground initiative, please contact us at groundtoground@gmail.com. Always happy to help out in anyway we can. If you are looking to make use of coffee grounds for your own garden, you have come to the right place. There is a whole series of articles on used coffee grounds and how they will benefit your garden. This link for the collection of articles for Ground to Ground, is where you will find a growing body of information on the collection and use of coffee grounds, and already the most comprehensive available on the web. What are some of the things that you are doing (or planning) to make a difference? Tags: coffee grounds, coffee logo, compost, fertiliser, used coffee grounds. Bookmark the permalink. Legend! If you want to write some posts about your adventures let me know. I read with much interest and pleasure the information you provided . From now on I will use the coffee grounds either used or not for my little garden. How do I keep squirrels from digging up my bulbs and eating them also I have a very large oak tree in my yard and the squirrels hide acorns in my yard and are always digging in my yard which is mostly flower beds. Will coffee grounds deter the squirrels? I’m getting desperate to stop them from digging but would never want to hurt them, help. This website is awesome and so are you! Thoroughly researched, well written, your love and passion for this is so very obvious. Plus, a lot of warmth comes through the writing and your accessibility to your readers. I’m in California, particularly Los Angeles. The soil that I’m dealing with is pretty much clay and appears to be nutrient poor. As I dig into it, I sometimes dig up rocks. Nothing has grown on it since I lived here except for a couple of patches of weeds that struggle to make an appearance plus the drought isn’t helping matters at all. This is nothing like the good Iowa soil I grew up seeing. I’m in the process of soil building using compost and green manure particularly peas and oats. My mom suggested used coffee grounds too to infuse the soil with more nitrogen and other nutrients. Plus, she said it’s also great for potted plants. I managed to get some used coffee grounds from a couple of Starbucks which I used on the soil in my garden and in the compost bins. Also, per this article, I added some to an area mulched with wood bark (got that free too from a tree-trimming project in my neighborhood) that a cat decided was his/her own litter box rather than something to protect the ground where I have jade and aloes growing. So far, I’ve not seen any evidence of the cat hanging out there since then and am hoping he or she got the message. I’m looking forward to seeing additional changes like healthier plants. Also, I’m encouraged by the support of the Starbucks locations that so generously shared with me. Basically, the manager at one said that she supports the Grounds for Gardening and whenever I need more bring a bucket with a lid lined with a plastic bag. They’ll fill it up and set it aside for me until I pick it up. Sorry for the long post. Bottom line, I really appreciate what you’re doing. Pingback: Sustainablog | Jeff McIntire-Strasburg has been blogging a greener world via sustainablog since 2003! Thank you Cecilia, and yes they go very well with egg shells. Not sure about the coffee sacks but worth asking. Had to stop using them because of all the compost worms – there were just too many! how can you have “too many”? i can never get enough. Great post. I love coffee grounds and gardening so seems like a match made in heaven! Seems to be a bunch of folks getting into the coffee grounds thing. Will need to give it a try THANKS. Yes please do Dennis – many benefits for your garden and community. Coffee grounds are great for the garden and I make my husband save them for me. I am not a coffee drinker, but he is one for sure. I knew that coffee grounds were good for your garden, but I never knew why. Thank you for sharing all of this very useful and informative information. Hi Shane: I am SO glad you stopped by my blog because it led me to your blog and this excellent article. First off, I LOVE coffee. Love it! And I always compost my grounds. However, I never knew they were this beneficial or thought of asking local coffee shops to save their grounds for me. This is amazing! I had a slight slug problem early in the season and could have used coffee grounds…and I see it may be effective against ants which have been a problem this year. So, thank you, thank you, thank you! I will definitely be following your blog starting today. Great to hear Shelley! Best of luck with out and please reach out if you need more info. Great to hear thank you. Please let us know how you find using it and if you need any advice I’m only an email away. Hi shane, great website and a great idea. I live in Perth, and we’ve got shocking soil in general. I started actively pursuing my organic vege gardening a year ago, and am constantly on the look out for new ideas to get some organics into the soil!! As an upside, I love my coffee and a new cafe has opened around the corner, so thanks for putting me onto your idea! I’ll be around the shop tomorrow to see if I can start collecting!! Congrats on spreading your passion. Awesome to hear from you Richard, and best of luck with the cafe. Please let me know how it goes with them and if there is anything I can do to help. Also – would be great to see some photos of what you are doing with that soil – I was born in Perth so understand the problem. Damn sand and more sand. Lovely climate for growing mind you, just need to work on that soil! Hey there! I found this post through another article through pinterest. Pays to post your articles in comments 🙂 Anyway, thank you for the extra information. I love the science of it all too. I did an experiment last winter to see if I could grow plants using JUST coffee grounds, for fun and out of curiosity. I grew a potato plant! It was great 🙂 Wish I took pictures. I will this year though. Yes please do Darlene, I’d be very interested to see how they end up. I’m growing my potatoes in car tires and am using a coffee grounds blend, but not 100%. Keep up the awesome work my Pinterest friend! I use coffee grounds on my roses. They seem to love it! I have noticed more blooms after I add the used grounds. Oh yes Teresa, roses do very well with coffee grounds. So well in fact that I wrote a post about it some time ago which you might find very helpful. Thank you for stopping by the site! I only wish I could compost my coffee grounds. Unfortunately, I use a Keurig which only leaves behind a small plastic container. Hi Stephen. Are you able to then compost what comes out of that? If not what do you do with the contents of the plastic container? Great blog Shane! I’ll be coming back for more tips soon! Love to hear it Val, thanks for stopping by. Great to hear from you Stephanie. Well done for getting into used coffee grounds, and I hope you find them as useful as the rest of us do. Regarding the posters, yes please! Print and hand out as many as you like – this is the very reason why I created them. Regarding copyright, all the material on this site is free to use for non-commercial purposes. Well done again, please let me know how you are going, and if there is anything I can do to help. Wow! I just read about your website and use of coffee grounds in a magazine today. I love my gardening, so I asked the shop where the mag was if I could have their coffee grounds – I now have my first bag! They had no problem with me collecting it, they’d just tossed it in a bag in their bin. I just love the smell, and look forward to testing it all over my garden. Thanx for getting the info out there as I would never have thought of it myself! Excellent news Charlotte and a pleasure to help out. Please let us know how you find using the grounds – I hope you find them as good to use as the rest of us!! What a fabulous contribution you are making to the environment, thank you. And it shows that you can do this from even a small garden, it is just about how you make use of the space you have. Great to see you on the site and hope you keep recycling those coffee grounds! This is great! My mom always used the coffee grounds. Now I know why and I’m starting now. Love that logo, by the way! Think I need to become a follower of this site. Great to have you here Rosy. At this some point please let us know how you coffee collection is going. Great post! Love the idea of the coffee shop “recycling”. We had a worm composting system when we lived and worked in Costa Rica and they were delivered in sort of a coffee “mulch” from the outer casing of the coffee beans. We’re just about to start a system here in India but are still doing the research on where to get the worms etc. Thanks for the reminder that they like their java as much as we do! Hi Shi – for indoor use keep it to very small quantities. No more than a handful every couple of weeks at most. Thanks for the great resource that these pages are. I live in Oslo, Norway a city that loves its coffee bars and I am sure has a huge potential when it comes to reuse of coffee grounds for gardening etc. I do not know of any initiatives here such as the one you run, and would love to see somethings starting up. And so I am thinking of initiating a project/program myself. I need to start doing some research, finding out how things work here, get some stats on amount of grounds etc and maybe how I can get some funding. I would probably want to start very small, in my borough where I am also involved in a transition town initiative which could be a good support for this. It would in any case be great to get some tips from you guys as far as how you started up, your experience and any tips etc. And if you have an email that I may be able to contact you on that would be great. Thanks your inspiration! Hi Siri – great to see you here! Please contact me via the email address – groundtoground@gmail.com with all your questions and I will be more than happy to answer them all. All you really need to do to get started is to have a place to use the grounds, a place to collect them, and a way to carry them out of there! Have not been here for a while and just saw your reply. Thank you! I will write to you one of these days. Can I please sugest an FAQ for coffee questions. Being in IT we find this a good appendage to information sessions. Would also be mentioning that my family have collected coffee grounds for many years to make vegetables and fruits bigger and healthier. I have heaps of coffee grounds and no use for them, apart from a small pot plant. Is it a good body scrub? Way to go Adeline. Coffee grounds are good for both of those, although I have to admit it has not been used as a body scrub in my house, there is plenty to suggest it is very effective (and cost free!). Thanks for stopping by and hope to see you back soon. Your quote “A gardener once told me that he didn’t feed plants, he fed the soil which feeds the plants.” rings so very true. Since I got my allotment I’ve become a real fan of composting and realise the importance of continually improving my soil. It’s a never ending job, but year on year I realise the benefits. And a very informative post about the coffee – thanks. That’s a great idea and you have a ton of comments! How do you get so many! Good question mate. I reply to almost every person that comes to the site with their thoughts, maybe that has something to do with it? As someone who has left a comment I can tell you why I did. 1) Most importantly I found you because you found me. You left a post on my gardening blog which means you’re out there surfing and keeping up with what’s going on (I’m hardly popular so you are not just following a crowd). I admire that. 2) Most importantly (yep, both are most important) this is a great blog with heaps of information AND it’s a fascinating subject. That’s a win, win, win combination. So once I came hunting for you as a result of 1) I’m hanging around and likely to post. 3) Least importantly (there had to be one) people like memake a reference to you in our blog because yours is so good which drives more traffic to you which means more comments. Super blog, super blogger. What more could you want? Wow. I’m speechless (and wordless)! Thank you for the endorsement, it is comments like these that make what I do such a pleasure. I am passionate about the environment and love coffee… in particular espresso. Thanks for stopping by Paedra and keep up the great work! Great post, very informative. Please tell me why you do not put pineapple in your compost. I am composting in Miami, Florida. I once added half a fresh pineapple into the worm farm, and opened it up a week later to find that over half the worms were missing. I did some looking online and came across an article explaining that there is an enzyme in pineapple that eats worms! Some other information appeared about how in some countries they use pineapple juice to rid the body of intestinal worms, and seeing how they are all related, it makes sense that it would be bad for all of them. Where it seems to have a reduced impact is if the pineapple is cut into small pieces and then left to rot for a week before adding to the worm farm. For whatever reason, most folks think this reduces the impact of pineapple on earthworms, but for me its just not worth it, so I add the fruit into hot compost. That was my question as well, about pineapple. Thanks for asking and for the answer. What is “hot compost” and how is it used? Hi Yumiko – hot compost is just compost but it is in the way it is made that is different. I’ve got a post about how to make and use it at this link. Thank you! I don’t have enough to make 1 meter cube of crippings. I will try in the fall when I’ll have a ton of leaves in my yard. I knew earth worms liked dirt but never knew that they liked coffee grounds. Wow. Well Pavan, worms (earthworms and compost worms), like, love, and adore coffee grounds!! Shane, you say you can dig grounds straight into the soil and they act as a slow release fertiliser but at the end of the article confess to preferring to make a liquid fertiliser. Why is that? I have one house plant that is a very hungry plant (a variety of prayer plant I believe) and I feed it often with a seaweed mix but I am sure it needs more. I’m thinking about putting some (how many?) coffee grounds straight into the soil but if you think making it as a liquid would be better, I’d give that a go. And if it works there, I’ve got a dozen more house plants (like a peace lily) that I suspect would benefit as well. Thanks for your blog and your help. Good question Laura, and kind of depends on what you are using it for. I find that using the grounds in liquid are easier inside the house, and that just might be because I’m one of those messy kinds of people that leaves coffee grounds all over the floor and on myself. Don’t know how it happens, but it does! Maybe add a handful of used coffee grounds to rain water for half an hour then add the seaweed mix, swish it all around and pour gently over the soil. You would not need a great deal of that kind of mix to see a difference, depending on the pot of course, even with 100ml you should be able to notice it. About 10 hours before I got your reply I dug coffee grounds into my zebra plant. We’ll see how it goes. I have great expectations! I may just try the grouds/rainwater/seaweed mix for my peace lily to see which takes off more quickly. Shane, great article. In a former life worked with many growers and was always astounded that they never took note of their greatest resource – the soil. These were major growers too! It’s their largest capital asset yet they treat it as if it’s worthless. Love the idea of the map and hope many get behind it. Thanks Corri, more people are getting onboard the initiative so eventually…. everyone?? This is my first visit and I’m glad I stopped by. I love your subject matter and I am quite intrigued with the fact that you’re sharing a way to make the world a better place. I’m not a coffee drinker or a gardener but I know plenty of both. I can’t wait to share this new knowledge with them in hopes of forwarding this awesome initiative. KEEP THE DREAM ALIVE! Many thanks Jermaine and please do pass on the knowledge. It is a great feeling to be turning what was destined to the tip into incredibly rich, vibrant, and produce soil. I’ve heard of this before, but your blog lends credence to the use of coffee grounds. I am going to try it immediately. Thank you! How many coffee grounds can I put garden? Thanks for that Mr Telecom, but I have a feeling that is not your real name? As for how much you can use, I stopped counting after 3 tonnes in my own suburban backyard, so yeah heaps of it. Great post – I’m a keen promoter of reusing coffee grounds so its good to see a like minded individual! Coffee has so many uses, apart from just drinking, so kudos to you for sharing it to the world, and in a good, informative manner too. Thanks heaps for that David, and all the best in your coffee grounds gardening endeavors. If you get around to it please send me some photos and I’d love to get a post on the site about it. just picked up my first bag of coffee grounds and cant wait to use them! Fantastic to hear that Prakesh. Best of luck with it and please stop by if you need any more assistance. Coffee grounds are a topic I enjoy. Great post!! Great to have you on the site Chris. I am somewhat interested in coffee grounds also!! Quick Question – How long will coffee grounds last in the garden? They tend to last a while in the garden Suzie. If you apply directly onto the soil then from my experience they will last from 2 to 3 months until you need to reapply. Hi there – can i reuse my espresso coffee grounds? You sure can Anthony. Reusing espresso coffee grounds is what this site is all about! Just save the coffee grounds and read up on this article and some of the others. You can use coffee grounds in compost, as a fertilizer, for worm farming, and as a pest deterrent. And more. If you have any other questions just write in. Cheers. You sure can Anthony. There are many reasons why coffee ground is good for the garden, and you will be able to find out all about it from this site. This Ground to Ground primer page is the best place to get started on how to use coffee grounds for the garden, and if you ever need more information just let me know. Cheers, Shane. Hi there Shane. Do you know how long does used coffee grounds affect soil in the garden? Well Derrick, there is a long term impact on garden soil as a result of using coffee grounds, and it is a positive one. This site is here to show how my soil improves and becomes increasingly productive, by using coffee grounds as a compost and worm farm additive, and as a nitrogen rich fertilizer. I’ve been rubbing the grounds into my hair as a natural dye. It really blends away the grays; It’s amazing! I might try it myself Margo. I’d heard coffee grounds could be used as a hair dye but never first hand. It now seems that you can be working coffee grinds into soil as well as into hair! Walking tall and stretching imaginations! Great initiative! 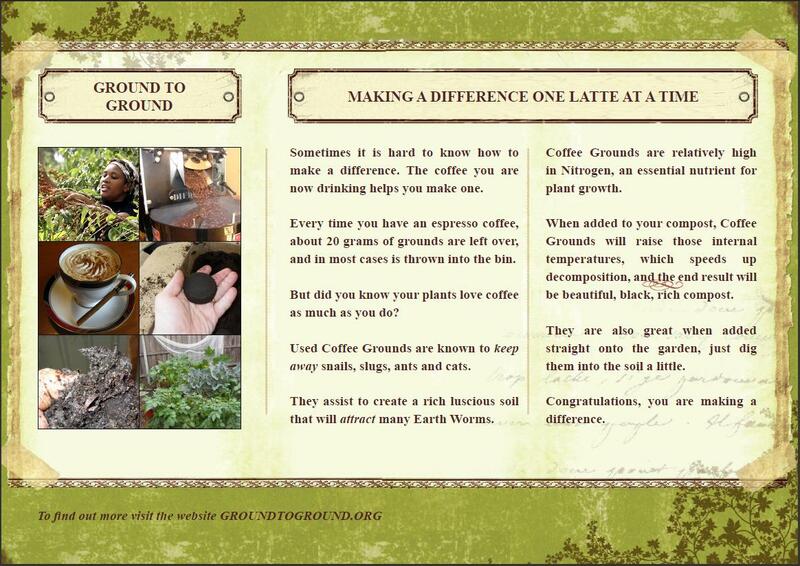 Keep good work getting those coffee grounds in the garden and that brochure of coffee shop is fantastic. Thanks Trev. It has nearly been a year of collecting and reusing coffee grounds for fertilizer and gardening. A great year mate!! Great post. We use our coffee grounds, well, my husband’s, as I’m a tea drinker in our compost for our organic garden. Of course the tea bags also go into the compost. We also pick the free grounds from Starbucks from time to time. Great to hear Chris. Both tea grounds and coffee grounds are great for compost. When I put tea bags into the worm bin they leave nothing of the whole thing, string and all. Thanks for stopping by the site. Hi, Shane. I am an avid gardener and environmentally friendly, but forgot all about using coffee grounds on my gardens. So glad you reminded me with this post. Great information. One of the perks of using gardening grounds is that I can meet people like yourself. Thanks! Thank you very much. You can use coffee grounds for compost and fertiliser, or even on the lawn. If you need any more info be sure to let me know. SG. This is a great idea for recycling coffee grounds that would otherwise add to the increasing landfill problem. It is also a great idea for cafes to advertise that they dispose of coffee grounds in this way, it may help to bring in some environmentally conscious customers! I’ve shared with FB and Twitter. Feng Shui is about living with the natural world this is a good way to start. Diane. Love the coffee logo also, looks great on my espresso machine!! what a great article! We compost and I always use the coffee grounds. Potato peelings are supposed to be very beneficial too though in winter I tend to put them in the fireplace because they do something to help cut down on creosote build-up in the chimney. What a wonderful article! Thanks. just a quick note..Awesome article by the way. Great coffee ground logo. I have been using coffee grounds in my compost piles for a few months now, with good results. I live on a Caribbean island. Asking for the spent coffee grounds at our local coffee shops, one is usually greeted with dumbfounded stares. Two shops now regularly supply me, even keeping it for me, whenever I miss a collection day. Thanks for such an informative post. I have often saved my grains, and just used them…without any real knowledge about what the coffee grains were doing for my plants. Well Rachel, consider this you coffee grounds knowledge base! Everything to do with using coffee grounds is being assembled on this site, and thank you for being part of it – SG. My grandma already knew about the benefits of coffee ground. I don’t have a garden but use it on my indoor plants. Exactly the way you said: mixing it in because otherwise it forms a crust on the surface which isn’t of much use. Great blog. Keep letting the public know about the advantages of coffee grounds in soil. Thank you Inka, this is great to see. I hear that often, that a grandmother/grandfather re-used coffee grounds in the garden or otherwise. A plants response to coffee is excellent, and I can image that it was just a normal thing to do at one time. Maybe this is an opportunity to do some more research on the history of using coffee grounds for plants? Yes they do like it straight from the cup! Well done and keep it going. That is fantastic to hear Brenda. Feel free to make use of any the materials on the site for any non-commercial use. Could I use coffee grounds for indoor growing? If so, could I apply it to the top of the soil or would it be better mixed in before planting? I would be using this for chili plants. Well Leo, you sure can use coffee grounds for indoor plants, and the general rule here is to use them is small amounts. So no more than 10% of the total volume. When applying to a potted plant, you should scratch it in so the grounds are not all sitting on the top, because they will form a crust that causes drainage and air flow issues. If you haven’t planted the chili yet, I’d mix the whole lot around first, water it, then get the seeds in. Hope that helps mate and best of luck with using coffee grounds for plants. Shane – I live in WA now, but I used to live in Brighton East and would shop in Bentleigh quite a lot (in the 80s!). Well done with this – we have the equivalent of one plunger a day, but you know where that’s going now! Ah music to my ears! I checked out that fish app you have running on your site, how cool is that! What a great article, and for me, timely. It had occurred to me recently that I could probably reuse my coffee grounds as plant fertilizer – house plants, as I live in an apartment. It does seem wrong somehow to throw them out in trash that goes to landfill… Thank you for this. You sure can use them for the house plants, just be mindful to limit how much you use in the smaller pots. They are also great in a compost pile, if you have a couple of neighbours maybe you could start one up?? I am so glad more and more people are coming on board Shane. Great! Here’s a link to see some of the pictures of my husband’s composting efforts. We are composting 100% of our used coffee grounds at our coffee shop. We also encourage people to do the same. A chum mailed this link the other day and I am eagerly anticipating your next article. Carry on on the wonderful work. I’ve been using my own grounds at home in my compost pile for about the last year, inconsistently. Your math on how it adds up has really convinced me to be consistent, and to ask hubby to see about collecting grounds at work. Our goofy little town only has 2 coffee shops (one is a green house that hopefully already composts its grounds), but we also have fast food and gas stations. You’ve inspired me to go ask them if they can save the grounds and put up your sign. How often do places ask you to pick up? When approaching a new place, how do you do it? Handing a letter to an employee hoping it will get to the right manager or what? I can imagine that the average gas station cashier doesn’t have the power to agree to such a crazy thing as saving the earth. I found you on the SFG forums. Peggy, thanks for writing in. Let me get to answering those questions. Firstly, the pick ups depend on the volume of grounds they are generating, so sometimes the smaller places only fill up a bucket every couple of weeks, and some of the busier ones do one every week. Then if you get other customers involved in getting the grounds, or the cafe owner figures out he has his own way to create soil and reduce the weight of his rubbish collection, they will start using it for themselves. And that is good also. As for the approach, I normally watch them working for a little while while drinking my coffee. At some point I ask them what they do with all the coffee grounds, and the answer is almost always ‘we throw them in the bin’. Sometimes they’ll know how good it is, but not often, and even then may only sometimes do something with them. After I tell them about coffee grounds as a natural fertiliser, I’ll ask them if I can start collecting some from them, and at that point they normally say OK, and this is where you might need to offer them a bin, or they will volunteer to put them into a container they already have. As for speaking with the owner, if its for the gas station then yes you will need to find out who that is and get them across the line. Most people are happy to help given the chance. And if it helps, I can send them an email also! Best of luck with it, you are doing a great thing. Let me know if I can help. I saw the story in the Progress Leader. Good work on promoting the re-use of an organic resource. I am an active collector and user of grounds in compost heaps. Have done it for 4 years. I collect mostly from starbucks, sometimes from small cafes. I use my compost on a community plot to grow vegetables for the family. Thank you for the comments Adrian. It is a real pleasure to hear from someone that is clearly well ahead of me in the coffee grounds collecting business! Please keep spreading the word, and if you want any stickers with the ground to ground logo let me know. Cheers. Coffee grounds are an amazing ingredient for making compost! I already sometimes ask for coffee grounds at my train station coffee shop (and before that, at work, though nowhere near as regularly as you) and this is a nice way to pass on the ‘why.’ You’d hope that coffee shops would want to do more to reduce their bill for garbage collection and that they would be willing to proactively offer grounds, just like Starbucks. I took part in my town’s garden tour this year and will pass this on to the other participants. That is great to hear and exactly what the logo is for. Keep up the good work mate. Interesting article. I’ll have to start saving my coffee waste for my outdoor plant pots!! The coffee must make your growing plot smell nice !! Just like a cafe most days Mina. Seriously, this stuff is great for most plants, costs nothing, and smells great. Please let me know how it goes with the coffee grounds, and you might find it easier with pot plants to add the grounds to a bucket of water first, leave for a few minutes, then slowly pour. Hey Shane – I like this initiative. Good for you and good for the earth! The more you write and learn a communication style that works, that will help you with comments. Also, always try to ask questions at the end of a post to try and draw your readers into your subject. You can invite criticism or agreement. You can also ask how others are saving the world – a popular topic! Best of luck to you! Thanks for the feedback Tim, much appreciated.